GREAT LAKES TODAY – Just off Lake Ontario in Irondequoit Bay, Dave Hulburt is doing some work at the BayCreek Paddling Center. The shop is closed in winter, but it’s unusually warm and sunny by the water. A few cars drive by, a flock of geese flies overhead, but other than that it’s quiet on the dock. Is that something he and his staff would have been able to do years ago? “Probably not,” he adds. Hurlbut has been working at BayCreek for about as long as the federal Great Lakes Legacy Act has been in place. He’s watched the condition of the water change over the years. The law was created in 2002. It aims to clean up spots where chemicals were dumped, and contaminants built up in sediment. It’s a big problem — 31 sites were targeted in Michigan, Wisconsin and other Great Lakes states. Don Zelazny remembers the harm that contamination caused. He grew up in Buffalo, where mills and factories once lined Lake Erie. Now he works for the state environmental agency as the Great Lakes Basins Coordinator. “So what we were seeing were these toxic contaminants: PCBs, pesticides, dieldrin and DDT,” he says. “These were actually moving up through the food web going from just being in the sediment, up to crayfish and then into bait fish like bass or walleye. To rehab polluted sites, each was assigned a list of specific problems to fix. Things like fish tumors, or beach closings. The Rochester site, on the south shore of Lake Ontario, was assigned 14 problems to fix. So far five have been removed, including problems with drinking water. After years of cleanup work, this might seem like slow progress. But Joseph Makarewicz, a retired environmental science professor at SUNY Brockport, says that’s not a surprise. He says it’s important to remember that the Great Lakes Legacy Act is just focused on sediment cleanup. That’s a small part of overall cleanup efforts. Back in Rochester, Hulburt hopes the lakes will clear up even more. And people won’t be so worried about getting wet. 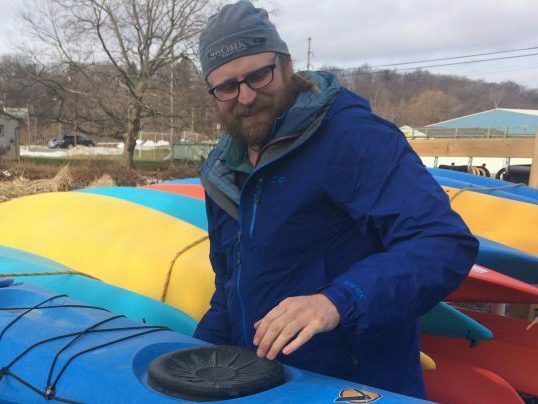 Out on Lake Ontario, where he teaches rough water paddling, he says every now and then a class has to be canceled due to a problem like algae blooms. But each season that happens less and less.